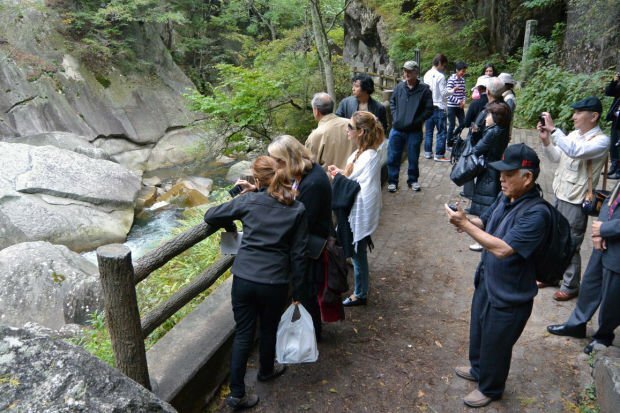 Lodi Mayor Alan Nakanishi visits Shosen-Kyo Gorge just outside Kofu, Japan on a trip to Lodi’s sister city. A group from Lodi visited Kofu in October, where they took part in official dinners and a city festival, along with seeing the sights in other parts of Japan. 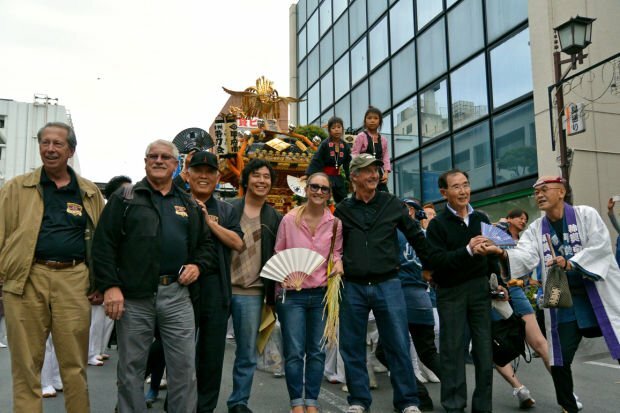 From left: Lodians Joe Hohenrieder, Lynn Benbrook, Mayor Alan Nakanishi, Masayuki Hattori, Hillary Joen Hetzner, Pete Hetzner and Jim Kim walk in a parade during the Kofu Daisuki Matsuri — in English, the I Love Kofu Festival — on Oct. 19 in Kofu, Japan, as part of a visit to Lodi’s sister city. Lodi Mayor Bob Johnson signs a a declaration in celebration of 50 years as a sister city with Kofu, Japan, as Kofu Mayor Masanobu Miyajima watches at Hutchins Street Square on Monday, Aug. 15, 2011. Joseph Hohenrieder, left, president of Luster Cal Nameplate Corporation, views a series of uncut wine labels with Masanobu Miyajima, mayor of Kofu, Japan, while touring the facility on Monday, Aug. 15, 2011. Dignitaries from Kofu, Lodi's sister city, are visiting to celebrate 50 years of being sister cities. The Lodi Sister City Committee was established in 1961. With 20 current members, its purpose is to promote the beneficial opportunities for each city that come with international relations — exchanges of people, products and ideals through cultural, educational, technical, professional, municipal, youth and sports activities. Lodi’s sister cities are Kofu, Japan and Lodi, Italy. Sister city, county and state affiliations between the United States and other countries began after World War II under president Eisenhower. Lodi has had an active relationship with its two sister cities for more than 50 years, including exchanging gifts and letters as well as planning visits. Kofu is the capital of the Yamanashi Prefecture. It’s located in the Kofu basin and is surrounded by mountains such as the Japanese Alps and Mt. Fuji. Nearby are the ruins of the Kofu castle. The Kofu basin has a plethora of hot springs, vineyards and various historical sites and temples. The area is known for its healing waters, such as the Yumura Spa. It is a three-hour car ride from Tokyo, or an hour and a half trip by rail. Kofu is known for its manufacture of jewelry made of crystal, natural stones, and pearls. The city is also known for its purses, belts and wallets made of a certain type of buckskin. They manufacture wines made from a variety of grapes, including some Tokay vine grafts sent from Lodi. The last trip Kofu occurred in 2013. Back then, the Lodi Sister City Committee brought a miniature statue resembling the late Rowland Cheney’s bronze “Celebrate the Harvest” in Downtown Lodi, according to Hinkle. In 2019, Kofu will celebrate the 500th anniversary of its establishment. Three members of the Lodi City Council will be traveling to Japan in April to help Kofu celebrate its birthday. Mayor Mark Chandler and Councilmen Alan Nakanishi and Doug Kuehne will join Hinkle in Japan to represent the city of Lodi. The other Lodi is a city of about 52,000 people and is located in northern Italy on the plains of Lombardy. It is about 26 miles southeast from Milan, which is notable for its university and being home of the grand opera house, La Scala. Lodi is a relatively small town, so it can be easily navigated on foot. It is located near four rivers, which explains its rich farming history and land. It was originally a Celtic village. Its patron saint is Saint Bassinianus. In its early life, Lodi underwent raids and battles, one of which included the famous victorious battle at the bridge spanning the Adda River. This event may have given the Lodi here in California its name. Ceramic manufacture has been a relevant industry to Lodi, Italy for centuries, spanning back to the first century C.E. Many cheese factories are also located there. Lodi, California and Lodi, Italy have been sister cities since 1958.